For a while, I've been trying to psych myself up to cycling to work. It ticks so many boxes - being physically active, reducing emissions, saving money. But cycling in London is TERRIFYING. There are loads more bikes than a couple of years ago, but I'm a wuss. After a while of feeling bad for lazily resorting to the bus, it finally occurred to me that there's another way for me to get to work under my own steam - walking. It's about an hour's walk each way. 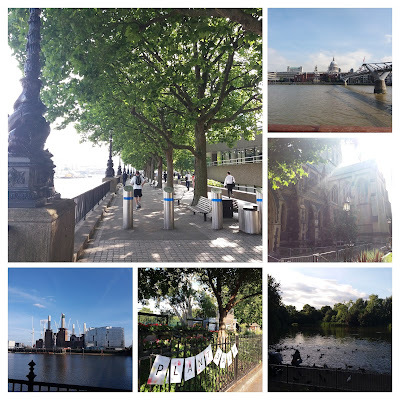 It's a walk that takes me across and along the River Thames for part of my walk, and I feel connected with this city in a totally new way. Yes, it's a longer travel time than the bus - but I arrive at work feeling energised and fully awake, ready to start the day. I've already achieved something and I haven't even switched on my laptop. It's a really good feeling, and it's kind of surprised me. I thought the long walks would feel like a chore, but they are a real joy, especially compared to the bus. It's time to think, time to listen to music or to podcasts, time to breathe and look around me. I pass through different faces of this city - through areas of great wealth and areas of social housing, through areas of business and areas of luxury residence, through parks and along busy roads. But my favourite bit is definitely the river. I always knew the Thames was tidal, but never quite realised that meant you can hear the wash of the tides lapping against sand, the croak of seagulls... Guys, it's like walking by the beach. But, y'know, not. Yey! I love walking in cities, and London is lovely, especially around the river. In fact, because the bicycle is actually an energy saving device, walking is even better for youth than cycling. I completely agree about traffic being terrifying. I can ride a bike but have never done so regularly because of the traffic - in the city, buses and cars, in the country tractors and lorries. I live in a small town and try to walk everywhere but it doesn't add up to very far because everything is so close together. Sounds like you have found the perfect solution! I know! Why did it take me so long to try it? ?